Bill on the gas in turn two at the Red River Co-Op Speedway last Thursday night. Photo credit: Tim Johnson. Following a win last Thursday night at the Red River Co-Op Speedway, and a second place finish at River Cities, Bill Mooney driver of the No. 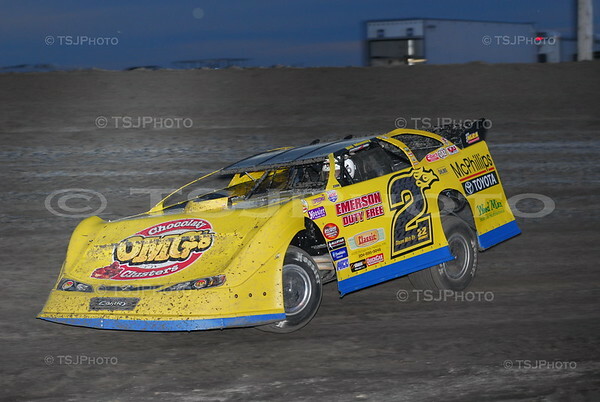 2 McPhillips Toyota/OMG Candy Millar Powered MasterSbilt by JMR looked to continue the hot start to this season, and he did with another runner-up finish in Winnipeg, and a hrad charger award at River Cities. On Thursday night at the Red River Co-Op Speedway in Winnipeg, another poor draw put Bill in the seventh starting spot in his heat race. He passed George Balcaen on lap one, Shane Edginton and Mike Martin on lap two, and one final pass of Paul Veert on lap three, for a third place finish. Bill has been running so strong recently that his point average is so high that it puts him towards the back of the invert, so Bill started fifth in the main event. Mike Balcaen came into the night with a lower point average due to not being able to finish the feature the previous week, so by the time Bill was done passing Edginton, Veert, and George Balcaen again, Mike Balcaen was gone, but Bill finished second to continue his streak of top four finishes to seven races in-a-row. On Friday night at the River Cities Speedway, Bill started fourth in his heat race, and was about to take third from John Buchner when the latter lost the handle of his car coming out of turn four and ran across the front of the 2 car, causing enough front suspension damage to cause Bill to have to retire from the heat race, handing him a monumental task of having to start 23rd in the main event. Throughout his career, Bill has always been a hard charger, and Friday night was no different. Bill climbed to 20th by lap three, 15th by lap seven, and into the top ten on lap 14. Bill spent the final six laps chasing down, and passing Steffen Snare and Shane Edginton for ninth and eighth respectively. Bill finished the race a the hard charger, improving an incredible 15 positions on a track that was prepared special for the Sprint Cars, and wasn’t necessarily conducive for great late model action. Bill has one win, six top fives, and seven top tens in eight nights of racing so far this season. The busiest week of the season lies ahead, as the Northern Late Model Racing Association races five races in five nights this week starting with a double header at the Norman County Raceway in Ada, MN on Wednesday and Thursday, a debut at the I-94 Speedway in Fergus Falls, MN, Saturday at the Viking Speedway in Alexandria, MN, and ending at the Buffalo River Race Park in Glyndon, MN. Bill Mooney Racing would like to thank: McPhillips Toyota, OMG Candy, Lucas Oil, Emerson Duty Free, Classic Trailer Sales, Weed Man, Curtis Carpets, Paintball Paradise, Maaco Auto Painting, Millar Engines, Bill Mooney Construction, Valley Powder Coating, Ohlins and MasterSbilt Chassis by JMR, Pizza Ranch of Grand Forks, for their support.